For Details, Click Here to Send Us an Inquiry At: sales@epoxy-paint.cn to see if this Glass-Flake Heavy Anticorrosive Paint Coating is right for your application. GF200 Series - GlassFlake GF200 Series protective coatings are formulated with premium Bisphenol ‘A’ polyesters and have been used for over 30 years in secondary containment, tank lining, pipe lining, pump lining, waste treatment and many other corrosive applications. GF200 Series protective coatings excel in both high and low pH environments, such as concentrated mineral acids and bases, while providing an extremely impermeable barrier from the penetration of aggressive chemical media. 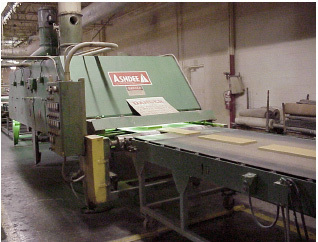 Flakeglass is added in quantity and size as required for the specific application. GF300 Series – GlassFlake 300 Series protective coatings are based upon chlorendic anhydride polyester and demonstrate excellent chemical resistance to oxidizing acids, chlorinated solvents, and most other chlorine/chloride applications. With a high heat distortion temperature and the Class I or Class II flame spread rating of this material, the GF300 Series excels in applications requiring flame spread resistance. Flakeglass is added in quantity and size as required for the specific application. GF400 Series – GlassFlake GF400 Series protective coatings are based upon 100% solids, polyamine-cured novolac epoxy resin systems, which exhibit excellent resistance to organic solvents, caustic environments, dilute acidic exposures and are also recommended for FDA-type food contact applications. GF400 Series products have excellent adhesion properties and very good abrasive resistance, and the addition of flakeglass provides excellent resistance to permeation. GF400 coatings are also well suited for crude oil and petroleum storage applications. GF600 Series – GlassFlake GF600 Series protective coatings are produced with premium vinyl ester resin systems and offer good resistance to solvents as well as excellent resistance to caustic and other high pH environments. GF600 Series’ higher tensile elongation makes them an excellent choice in applications which undergo cyclic process temperature changes. The addition of flakeglass provides protection against severe chemical exposures and immersion service. Typical applications are found in the water/wastewater, pipeline, and chemical industries. GF1500 Series – GlassFlake GF1500 Series protective coatings are based upon premium, isophthalic polyester resin systems, which provide cost effective chemical resistance in salt spray and refined petroleum product applications. GF1500 Series is used on offshore oil platforms, cargo ship, and petrochemical tank lining applications. 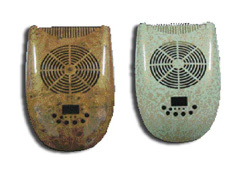 Its excellent water resistance makes it ideal for marine environment situations. Flakeglass is added in quantity and size as required for the specific application. 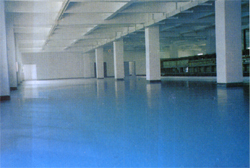 GF4100 Series – GlassFlake 4100 Series protective coatings are produced with 100% solids, polyamine-cured novolac epoxy resins and are designed for resurfacing old and protecting new concrete floors from chemical and physical abuse. In addition to flakeglass, GF4100 Series products are aggregate filled to produce a mortar like consistency that may be troweled or power-troweled. GF4100 products exhibit excellent chemical resistance, inherently provide skid resistance, and may be used in both refrigerated and higher temperature applications. It is authorized by USDA for use in federally inspected meat and poultry plants. GF4900 Series – GlassFlake GF4900 Series protective coatings are modified novolac epoxy polysulfide coatings that provide high-build protection for steel or concrete surfaces. This family of products exhibit exceptional flexibility, elongation, and strength for bridging minor cracks or for substrates that have high vibration and/or movement. In addition to the extreme flexibility, GF4900 products possess a high level of abrasion and moisture resistance. This material is widely used for tank lining, wastewater applications, and monolithic floor coating where crack bridging is an objective. 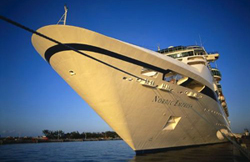 GF6100 Series – GlassFlake GF6100 Series protective coatings are produced with premium novolac vinyl ester resins which exhibit excellent resistance to solvents and improved resistance to organic acids and bases. GF6100 Series products are used where aggressive solvent and/or high temperatures are present. Typical applications include tall oil, pulp mill black liquor, ethyl alcohol, and super unleaded gasoline. 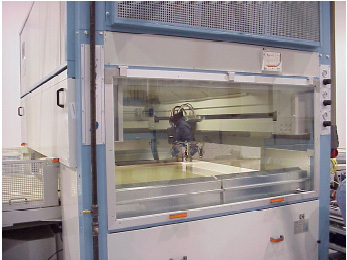 Flakeglass is added in quantity and size as required for the specific application. GF1300 Series – GlassFlake GF1300 Series primers are solvent-borne, moisture-cured, two-component polyurethane resin systems used to seal concrete substrates and provide a bonding surface for polyester and vinyl ester based GlassFlake protective coatings. 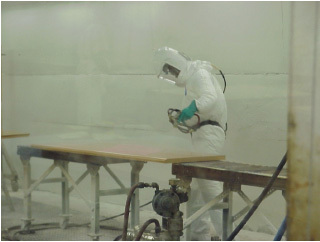 GF1300 Series primers may also be used as a bonding agent when GlassFlake coatings are applied over fiberglass (FRP) surfaces. GF1400 Series – GlassFlake GF1400 Series primers are based upon solvent-borne, two-component epoxy resin systems used primarily as concrete sealer or primers for epoxy-based coating systems. When used as a concrete sealer, the formulation exhibits excellent penetration and good abrasion resistance, making the coating an excellent anti-dusting coating for new concrete structures. As a concrete primer, GF1400 products exhibit very good penetration and secondary bonding characteristics to epoxy overcoats. 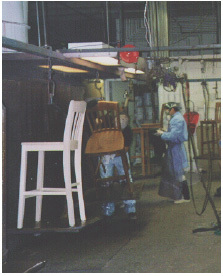 On metal, the primer preserves the integrity of the blasted substrate for several days, until polyester or vinyl ester topcoats can be applied. GF1600 Series – GlassFlake GF1600 Series primers are based upon flexibilized premium vinyl ester resins and provide excellent bonding characteristics to both concrete and steel substrates. GF1600 products can be used to prime large blasted steel surfaces to preserve their integrity until over coating can be accomplished. GF1600 products are highly corrosion resistant. GF1700 Series – GlassFlake GF1700 Series primers are 100% amine-cured epoxy resin materials that cure in the presence of water. These primers are used principally to prime and seal wet concrete areas, which are to be over coated with epoxy finish coats. Typical applications include sumps, wet wells, trenches, shower rooms, or any application in a high moisture environment.